Summary: Marchiafava-Bignami is a rare toxic disease seen mostly in chronic alcoholics that results in progressive demyelination and necrosis of the corpus callosum. The process may extend laterally into the neighboring white matter and occasionally as far as the subcortical regions. We present the MR imaging findings in two patients who presented acutely and review the features of the disease and of other acute alcohol-related disorders. Marchiafava-Bignami disease (MB) refers to a disorder resulting in demyelination of the corpus callosum. It was first described by two Italian pathologists who identified it in the autopsies of three patients who presented in status epilepticus and subsequently developed coma (1). All three patients were chronic alcoholics and had consumed considerable amounts of red wine. We present the MR imaging findings in two patients with MB, discuss the differential diagnosis, and review the disease. A 56-year-old man presented with vertigo and unstable gait of 2 days’ duration. The patient had been an alcoholic for 25 years and had been diagnosed with hepatic cirrhosis more than 10 years earlier. He consumed a daily average of 500 mL of rum (29% proof). Physical examination showed a malnourished individual with short- and long-term memory deficits, agraphia, impaired motor coordination, a wide-base gait, rigidity, and overall diminished reflexes. Pertinent laboratory values included hypoglycemia and low serum levels of vitamin B12, folic acid, and albumin. A CT showed only cerebral and cerebellar atrophy. MR imaging demonstrated areas of low T1 and high T2 signal intensity, and fluid-attenuated inversion recovery (FLAIR) imaging in the genu and anterior body of the corpus callosum showed mild pervientricular white matter areas of hyperintensity (Fig 1). On the basis of the clinical history, findings on physical examination, and imaging features, the diagnosis of MB was made. Intravenous vitamin B complex was administered, and the patient was discharged after 2 weeks to a long-term care facility, where he later showed a relative improvement of his symptoms. A follow-up MR study, obtained 3 months after the initial study, showed persistent high signal intensity in an atrophic corpus callosum and no periventricular abnormalities (Fig 2). Case 1, a 56-year-old man who presented with vertigo and unstable gait of 2 days’ duration. A, Parasagittal MR T1-weighted image shows multiple areas of decreased signal intensity involving the genu and the anterior aspect of the corpus callosum. B, MR T2-weighted image corresponding to A shows the lesions to be hyperintense and also some mild atrophy of the involved portions of the corpus callosum. C, MR Axial T2-weighted image shows a mild degree of periventricular white matter hyperintensity, particularly in the region of the frontal horns of the lateral ventricle. D, Axial T2-weighted image at the level of the centra semiovale shows a mild degree of periventricular white matter hyperintensities. Case 1, follow-up MR images obtained 3 months after the initial study. A, Parasagittal T2-weighted image shows persistent hypertensity in the genu and anterior body of the corpus callosum. B, Coronal T2-weighted image from the follow-up study shows atrophy and increased signal intensity in the corpus callosum and no periventricular white matter abnormalities. There is prominence of CSF-containing spaces secondary to diffuse atrophy. A 65-year-old man known to be a chronic alcoholic and to have hepatic cirrhosis presented with an acute onset of altered mental status, seizures, and Parkinson-like movements. On average, the patient consumed one to two bottles of red wine per day. Physical examination revealed loss of short- and long-term memory, unsteady gait, rigidity with cogwheel-like movement, and lack of motor coordination (particularly fine motor skills). Pertinent laboratory values included low serum levels of thiamin and albumin and hypoglycemia. MR imaging showed high T2 and FLAIR signal intensity in the posterior body of the corpus callosum and in the deep and superficial white matter of the frontal lobes (Fig 3). The patient was admitted and given intravenous vitamin B complex, which resulted in a nearly complete resolution of the clinical manifestations of the disease. Repeat imaging was not possible, because the patient was lost to follow-up. Case 2, a 65-year-old man, known to be a chronic alcoholic and to have hepatic cirrhosis, who presented with an acute onset of altered mental status, seizures, and Parkinson-like movements. A, Midsagittal MR T2-weighted image shows increased signal intensity in the posterior body of the corpus callosum without any mass effect. There is atrophy of the cerebellar vermis particularly its superior aspects. B, Axial MR FLAIR image shows increased signal intensity in the frontal white matter and in the periventricular areas. MB disease or syndrome is a primary degeneration of the corpus callosum associated with chronic alcohol consumption but is occasionally seen in nonalcoholic patients (2, 3). It is generally accepted that the disease is mainly due to a deficiency in the vitamin B complex, and although many patients improve following administration of these compounds, others do not, and some die from the disease (1, 4). At first, MB was thought to be particular to individuals living in the central region of Italy and consuming large amounts of inexpensively manufactured Chianti red wine. It is now known that MB occurs worldwide and that all alcoholic beverages are implicated. Most patients are male, between 40 and 60 years of age, and have a history of chronic alcoholism and malnutrition (1, 5, 6). The disease typically affects the body of the corpus callosum, followed by the genu, and finally the splenium (7). The entire corpus callosum may be also involved. Other white matter tracts such as the anterior and posterior commisures and the cortico-spinal tracts may be involved. Lesions may be also found in the hemispheric white matter and in the middle cerebellar peduncles. The subcortical U-fibers tend to be spared (7–9). The corpus callosum degenerates and splits into three layers (“layered necrosis”). The middle layer is the most affected. Only the body or all of the corpus callosum may be affected. The necrosis leads to cystic cavities. During the acute phase of the disease, there are infiltrating macrophages but only a mild inflammatory reaction. The initial loss of myelin eventually gives rise to axonal loss. The reason the corpus callosum is affected is not known. Occasionally, the lateral putamina and the cortex (particularly layers 3 and 5) are involved (7–10). Diagnosis is made on the basis of clinical findings in combination with imaging features (11, 12). Patients present acutely with mental confusion, disorientation, neurocognitive deficits, and seizures. Muscle rigidity and facial trismus may be severe. Most patients presenting with the acute type of MB will go into coma and eventually die, although as illustrated in this report, some survive. Acute MB may be difficult to distinguish from Wernicke encephalopathy and may occur together with it. Patients with Wernicke encephalopathy have ataxia, ophthalmoplegia, nystagmus, and confusion. Patients with the subacute type of MB—which is characterized by dementia, disarthria, and muscle hypertonia—may survive for years. The chronic form of MB is characterized by a chronic dementia. In this latter form, the differential diagnosis includes Alzheimer disease, multi-infarct dementia, and Pick disease. Also, chronic MB may have features similar to Korsakoff dementia. In Korsakoff dementia, patients have polyneuropathy and confabulation. Patients with MB may also present with hyponatremia. It is well known that rapid correction of the hyponatremia may lead to osmotic myelinolysis, and because 10% of all patients with pontine myelinolysis will have extrapontine lesions, some have suggested that MB may be yet another manifestation of the osmotic myelinolysis syndromes (5, 11, 12). On MR images, patients with MB show areas of low T1 signal intensity and high T2 and FLAIR signal intensity in the body of the corpus callosum at times extending into the genu and the adjacent white matter. These lesions do not have mass effect and may show peripheral contrast enhancement during the acute phase. Eventually, the lesions cavitate and become well marginated (7, 11, 13, 14). The lesions are difficult to visualize on CT scans, where they appear as hypoattenuated areas (15). 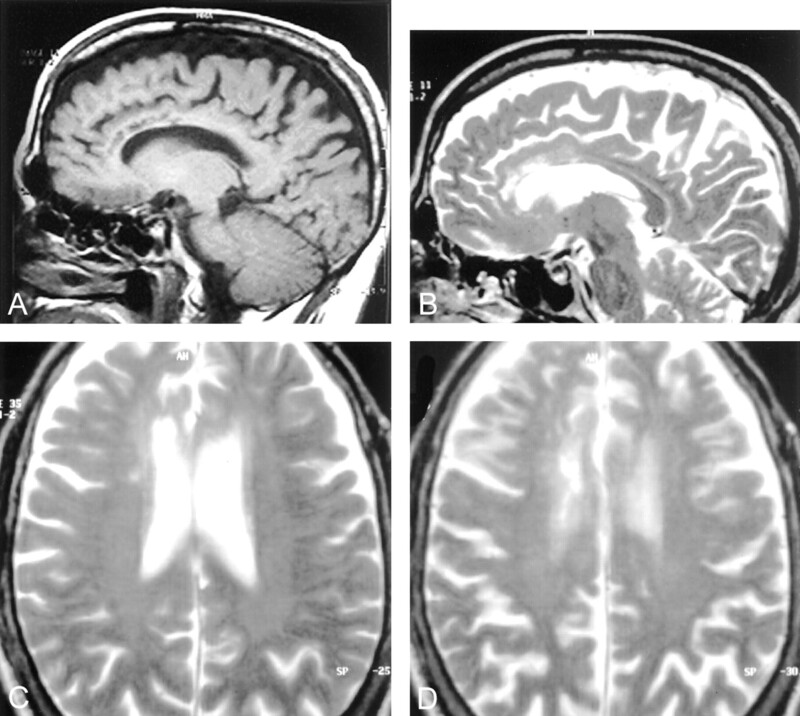 Other lesions involving the corpus callosum that may have a similar appearance include infarctions, shearing injuries, and demyelination process (11, 12). Tumors in this location generally have significant mass effect and contrast enhancement and are easily distinguished from MB. Differentiating acute MB from Wernicke encephalopathy is not difficult, because in the latter, MR imaging shows abnormal signal intensity and contrast enhancement in the mamillary bodies, periaqueductal region, and the walls of the third ventricle. Acute pontine myelinolysis presents with abnormal T2 signal intensity in the base of the pons, and when extrapontine lesions are present, they generally involve the deep gray matter structures that are surrounded by white matter such as the basal ganglia (12, 16). MR spectroscopy has been used to evaluate patients with MB. In a recent report, the initial MR spectra showed a mildly increased choline level (probably secondary to acute demyelination), low N-acetyl aspartate (probably secondary to neuronal damage), and the presence of lactate (17). On long-term follow-up after treatment, the spectra showed nearly complete normalization of the peak heights. Acute MB is a disorder found in chronic alcoholics that should be differentiated from other alcohol-induced lesions. Increased T2 signal intensity involving the body of the corpus callosum is present, and when identified in the correct clinical setting, the diagnosis of acute MB disease can be made. Prompt therapy may result in survival of these patients. Accepted after revision March 28, 2003.